New research aims to reduce chances of bats drowning in backyards. (Inside Science) -- We usually associate bats with dark places, such as caves, belfries, and attics. But homeowners have increasingly found dead bats in their sun-soaked swimming pools. "Bats are drinking from swimming pools all over the country," said Joy O'Keefe, assistant professor of biology and director of the Indiana State University's Center for Bat Research, Outreach, and Conservation, in Terre Haute. "And some simply drown there." Responding to reports of drownings, her research team has launched a nationwide survey to discover why bats are dying in swimming pools, the areas where they are dying, and if there is a way to minimize it. Once they answer these questions, they can tell pool owners what to do to reduce the risk that their pools pose to bats. "It might help people to remove obstructions around pools or put in escape ramps so bats can swim around and get out," said O'Keefe. The survey builds on a similar study that the team carried out last year. In that, more than three-quarters of the 370 respondents reported seeing bats in their pools, and 13 percent reported drowned bats. "We got good data and good spatial distribution, but we need more to make the conclusions concrete," said Zachary Nickerson, an undergraduate involved with the research. Bats frequent swimming pools for a basic reason: liquid refreshment. "They drink quite a lot," O'Keefe said. "Lactating female bats may drink several times a night." And while insect-eating bats can obtain water from their prey and nectar-consuming bats from nectar, ground-based sources of water are their main source of hydration. Bats typically swoop down on natural pools, ponds, streams, and other calm bodies of water, take sips of water, and fly away. The process takes place in one smooth motion. "They drink while in flight because it would be unsafe to land; it would open them up to predation," said Dan Taylor of the Austin, Texas-based Bat Conservation International. Swimming pools may provide useful substitutes for natural water sources, particularly in arid areas. But small pools or obstructions around them can hinder bats' ability to return to the air. "It's likely that they can't pull up fast enough or have a long enough runway and crash into a wall," O'Keefe suggested. 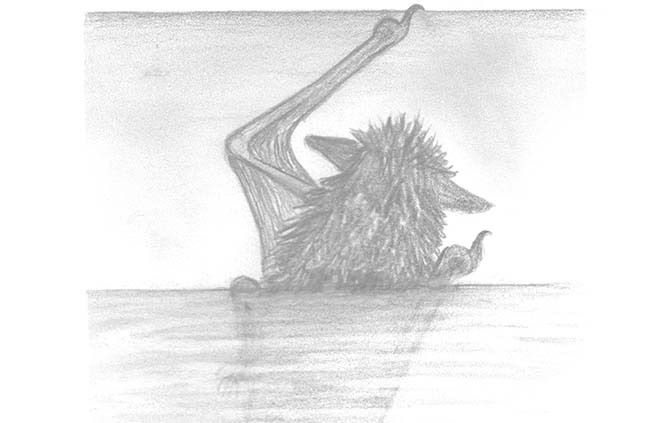 Once in the pool, bats face a struggle to survive. "They're pretty good swimmers; they all swim like little rowboats," Taylor said. "In natural ponds, they'd swim to the side and crawl out, find a tree and take off from there. But the walls of swimming pools can make it impossible for bats to climb out." The Indiana State survey would reveal statistics that might help protect the bats. About three years ago, O'Keefe heard from two friends in South Carolina who had discovered drowned bats in their pools. She consulted Taylor, who reported several more findings. He suggested that it might become a significant issue. O'Keefe then recruited Nickerson, who was seeking a research project related to conservation. They set up last year's survey, in hopes of identifying regions most affected by the problem. In fact, O'Keefe recalled, "it produced no clear patterns of where the drownings were happening -- whether there were more in the desert southwest or the southeast." The current survey "extends and tweaks last year's," O'Keefe said. It is simpler and contains pictures of different types of bat that respondents might recognize, as part of the effort to help categorize which bats use pools. "If you own, use or manage a swimming pool, you can provide valuable information. Even if you have never seen a bat near your pool, that's important," the team said in a press release. The group aims to obtain at least 1,000 responses by December. The results could suggest the best ways of protecting bats from drowning in swimming pools. There are already a few options on the market. Taylor said that ramps designed for water tanks used by livestock might be adapted for pools, among other options such as the Skamper-ramp, a device that enables household pets and other small animals to climb out of pools, and the FrogLog, a floating platform that prevents amphibians from drowning. The survey comes at a time when bats are receiving better press. That's because biologists are countering many of the myths that surround bats. "They don't all carry rabies, although I would caution people not to handle any they find in their pools," O'Keefe said. "They are the only mammals capable of flight. They are their own order, called Chiroptera, or hand-winged, which contains more than 1,300 bats. And many are long-lived, reaching 20 to 30 years." Overall, she concluded, "They're pretty amazing creatures." Peter Gwynne is a freelance writer and editor based in Centerville, Massachusetts, who covers science, technology and medicine.